Acterna’s new optical network testers. ACTERNA has announced two enhancements to its ONT-30/50 optical network transport testers that enable more cost-efficient deployment of high-speed networks. With these new features, network technicians using ONTs can now swiftly and efficiently gain access to any part of a dense wavelength division multiplexing (DWDM) network to troubleshoot and repair errors. Specifically, Acterna's ONT family of testers is now available with two new modules - the OAM-200 optical amplifier and the OSA-161/201 optical spectrum analyser, which includes an integrated channel isolator for signals up to 10.7Gbit/s. By providing this unique combination of optical amplifier and channel isolator, network technicians can tap into any part of a DWDM system regardless of the signal power level. Once isolated, the channel can be fed to a BERT or Q-factor module inside the ONT-50 for further analysis. Fully integrated, the ONT-50 ensures efficiency by significantly reducing the number of test sets required for DWDM testing. 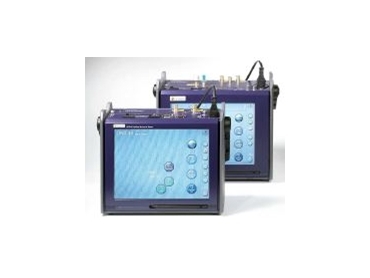 The new OSA-201 is the only dual-port analyser available on the market today. With the ability to test two independent DWDM channels simultaneously, the device allows field technicians to qualify optical components such as erbium-doped fibre amplifiers (EDFAs) while in-service. In addition, both input and output signals can be measured automatically, and the integrated calculation software, which is built-in to the OSA-201, enables the entire test process to be carried out at the touch of a button, saving significant test time in the field and analysis time in the office.